I enjoyed a lovely sleep! It was warm and flat and thankfully totally bear free. I didn’t wake until gone 7am. This is very, very late by PCT thru-hiker standards. I felt a pang of guilt and a twinge of shame. I eventually left camp at gone 9 o’clock, not a time that is conducive of big miles. I’m fast coming to the conclusion that I’m not a particularly good thru-hiker. 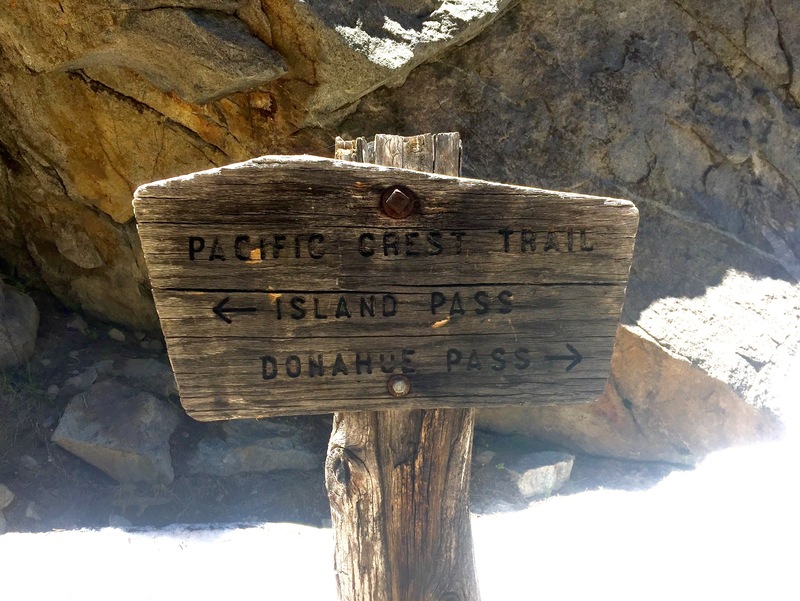 Today I had to tackle Donahue, the last of the snowy passes. 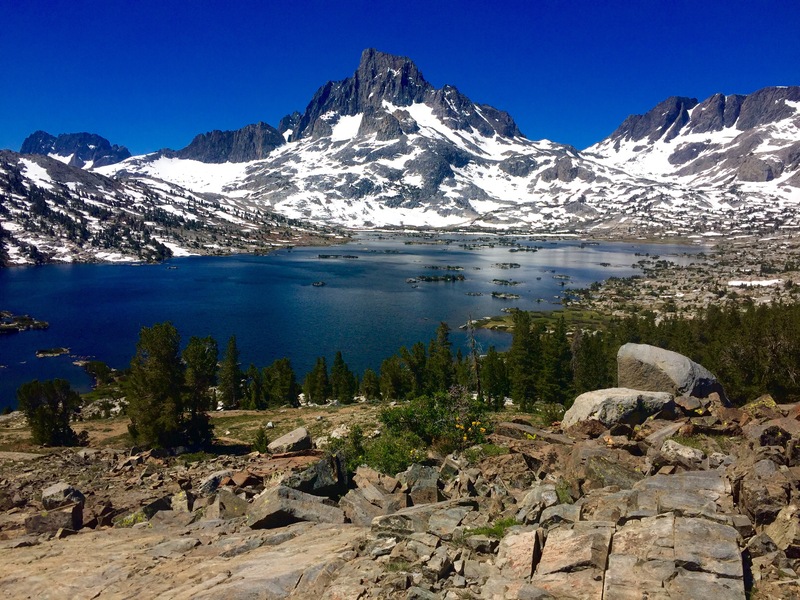 Southbound JMT hikers were reporting snow but nothing too dramatic and hopefully no terrifying icy traverses. Given the gentlemanly hour of my departure, slushy postholing seemed more likely to be the main cause for concern. Either way, before I reached Donahue, I had to get over Island Pass. More water obstacles to tackle! Island Pass turned out to be not much of a pass at all. In fact I passed it by without even realising that I’d passed a pass! The views over 1,000 Island Lake were jaw drop amazing. However, all that water needed to go somewhere and somewhat unsurprisingly, the rivers, creeks and crossings were equally jaw dropping. I was grateful of Butterfly’s teachings and confidently put my new skills to work. A Tale of Two Passes! By the time I’d dealt with Island Pass and was at the bottom, looking up at Donahue, it was almost noon. I decided to rest and eat, not because I was particularly hungry, but mostly because I was pissed off with how overloaded my pack felt. Food is so heavy and there seems to be a bizarre inverse correlation between cost and weight. Sadly my budget no longer stretched to the luxury of lightweight freeze dried meals! 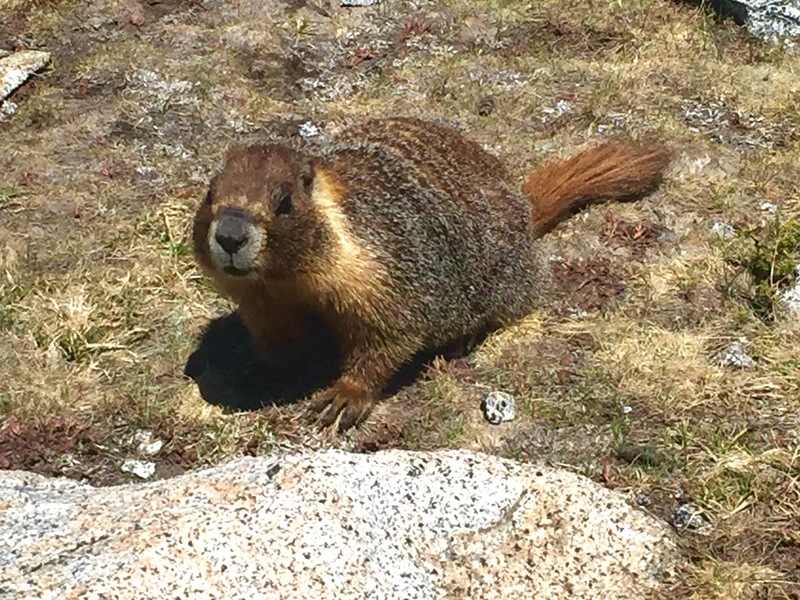 My mate marmot, greeting me at the top of Donahue Pass! ﻿The ascent was tough and I felt really slow and pathetic as I virtually crawled up past 10,000ft. Much to my delight there was a mini-bear at the top to greet me. I hung out with the marmot for a bit and then I officially crossed into the Yosemite Wilderness and started heading down into Lyell Canyon. 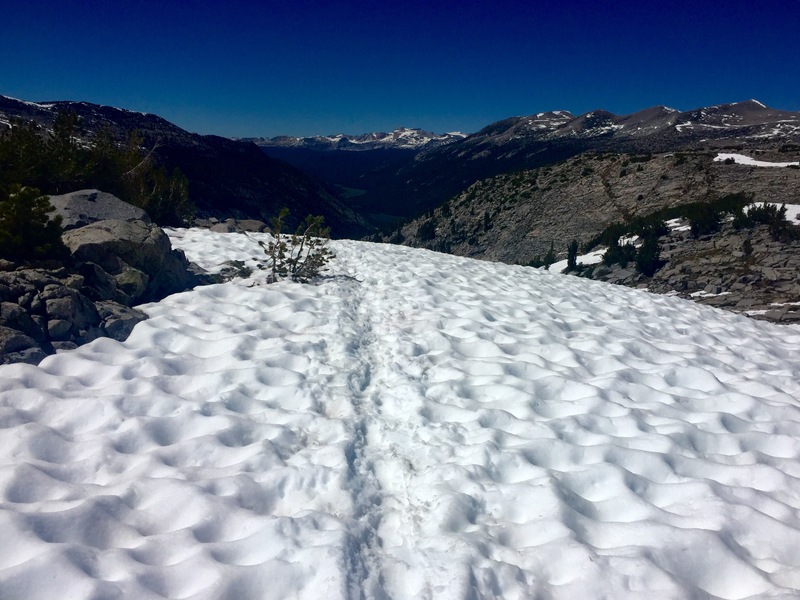 The snow on the north side of the pass was bordering on dramatic, but I bravely pushed on through more than a mile of soft, slushy snow and then I postholed through a boulder field for another mile … Oh, such joy! Soft, slushy snow onbthe way down! When I was eventually clear of the snow, the trail dropped sharply down to the valley floor and a lush meadow that was very characteristic of Yosemite. I had planned to camp just before Toulomne Meadows but I discovered a 4 mile “no camping” restriction around the whole area. I was forced to find a camp along the valley. I had no problem finding a flat spot to pitch my tent, however I was having a problem finding someone to share this flat spot with. There was simply nobody around. Where had everyone gone? A lonely camp, somewhere deep in bear country! I resigned myself to spending the night alone and then whiled away the rest of the evening by bravely trying to reassure myself that Black Bears weren’t that dangerous. The bears in and around Yosemite Wilderness are well known for their cunning and, having become habituated to humans as a source of food, they are a genuine threat to any thru-hiker. All alone, eating my instant mash potato and packet salmon, I felt irrationally vulnerable and very on edge. I promptly came to the conclusion that the blissful ignorance of sleep and the muffled silence of earplugs would be my only salvation. It was going to be a long and lonely night! 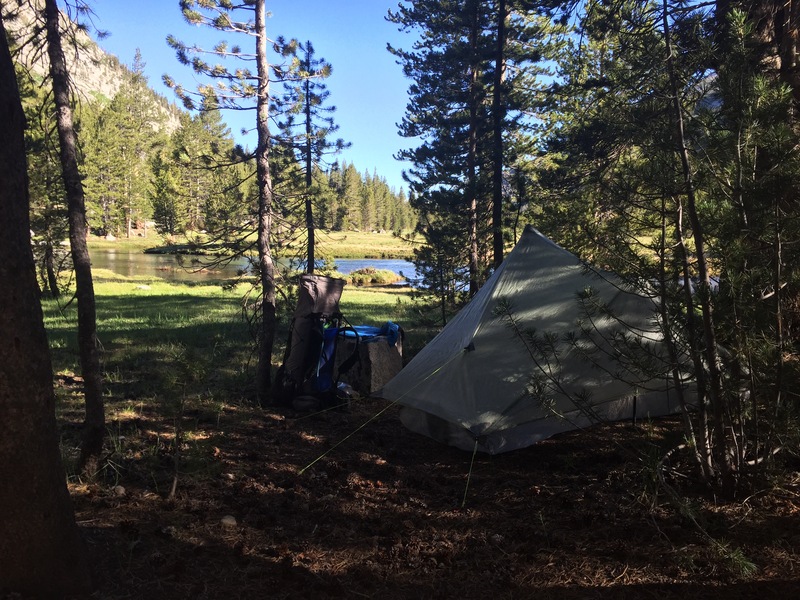 Previous Post PCT Day 69 – The Devil’s Work! 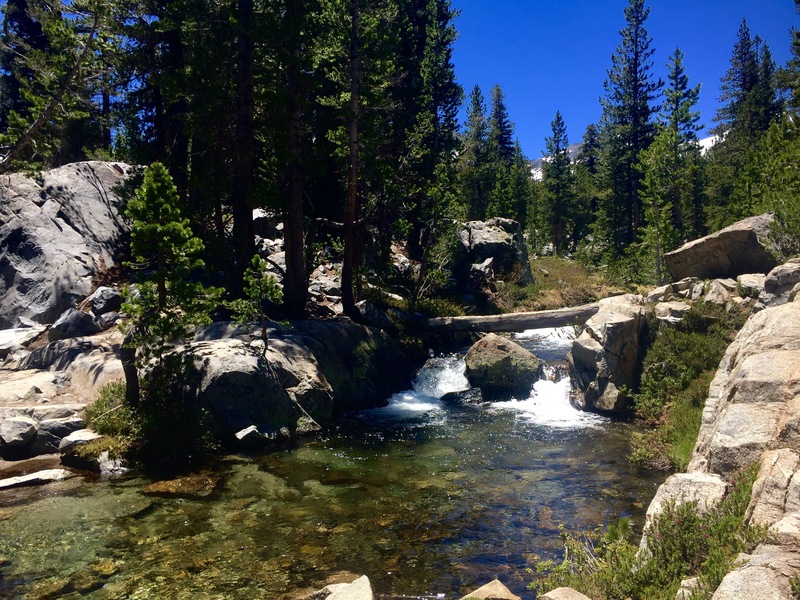 Next Post PCT Day 71 – Yes, Yes, Yes … Yosemite!! No posts from the 22nd, although you did reply to Bob (BOB! !Who knew??) on the 28th. It’s now August 3rd. What gives? If you’ve been eaten by a bear, I feel that at the very least you should have the decency to post something about it (or even some pictures…) so people don’t waste time waiting for your next missive!! I was starting to worry, too. So glad to see your July 28th reply. Your journal is one of the best. Let me know if you are okay. Hollywood, I’m fearing your PCT hike has come to an end, it has been many days since I last seen a post. If yes, I admire what you’ve accomplished, something few could do, if no, there are a few of us anxious to know you are alright and still headed north. I have also been closely following Hammer and Corky and very sad to learn that Corky has a broken ankle and will not finish…it’s Hammer time as he completes the trail solo…best of luck, miss your updates. Hi Bob. Thank you for your kind words. I’m still on trail. Reliable cell service is hard to come by so posts have become more sporadic. However, I’m still writing every day and will post when I can. Hello, Hollywood. I have been following you since Campo, and loving your posts. I’ve been to Reds Meadow trail Angeling three times this summer, and was sorry to miss you. I saw from a post that we were there at the same time. It’s my favorite place in the world, specifically Iva Belle cg. You are doing so fantastically well, don’t kick yourself for sleeping late occasionally. You surely deserve it after all the hard walking. Best of luck, happy trails, and can’t wait to hear more. So rumours of the PCT being over-crowded are exaggerated? PCT Day 38 - Avoiding the Rabbit Hole!